Winterstrike is at war and the target of deadly bombardment. Even so, the last thing Canteley expects is for her mother to send her away, and in the company of her formidable aunt at that. Aunt Sulie is a member of the ruling Matriarchy, who wrap secrets around them as thick as winter snowfall. When Sulie takes her to the abandoned city of Tharsis, Cateley little imagines that the trip will unearth secrets long hidden and reveal the truth behind her own past. Recurring images of a blood red tower standing in the shadow of Olympus Mons have haunted her dreams. Now, at last, she has a chance to discover what they mean. 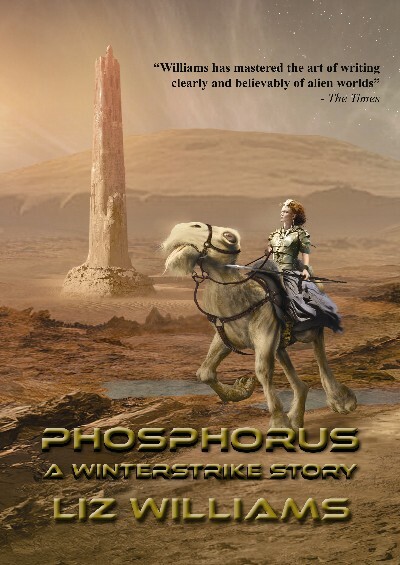 In Phosphorus, Liz Williams returns to the harsh Mars of her critically acclaimed novels Banner of Souls (shortlisted for the Arthur C. Clarke Award) and Winterstrike, delivering a tale laden with mystery and menace, as the Red Planet’s bloody past and troubled present collide.